The Fulbright Sakai site is where you can find resources, announcements, past funded proposals, submit your proposals for feedback, and view a master calendar of Fulbright related events. It is important that you join the site early as all official Fulbright @ UNC communications will be sent through Sakai. Enter your Onyen username and password and log in. The My Workspace page will appear. 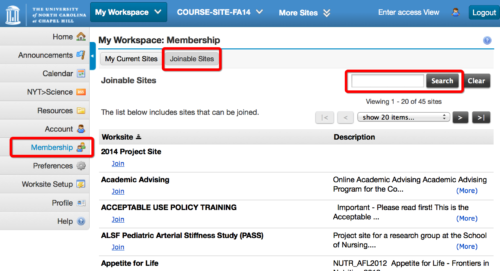 Click the Membership button located in the left navigation menu. Click the Joinable Sites button to view the available sites. Use the Search field (right side of the page) and search for “Fulbright Student”. The Fulbright Student site should now appear as a tab at the top of the page. If you have many sites, be sure to look under “More Sites” on the top navigation bar in Sakai. You can then click “preferences” to change the order of sites.